The Nottinghamshire Glow Worm Survey is an ongoing project aimed at contributing useful distribution data on this decling species. For more information and to see the latest survey results contributed to the scheme, please click the Nottinghamshire Glow Worm Survey banner above. Please join in and if you do, feel free to use the online form to send us your sightings and contribute to the survey. It should be remembered that our survey area was reduced again this year, so while numbers may seem to have been down on previous years, initial examination of the data shows that the total number of Glow Worms per area, was more or less what would be expected for most areas surveyed. The high number of males has also been the subject of many conversations between Glow Worm enthusiasts this year, but the percentages of 'one night' females also proved similar to other seasons, despite us thinking it was very much to the contrary. Only a few new females appeared from mid-June, after we had expected an early finish to the season. The 2017 glowing season appeared to have finally ended on July 8th (at least two weeks earlier than expected) but after a run of five consecutive blank nights, two new females promptly appeared on July 14th. Only female 272 remained after July 16th and she continued to glow until disappearing on July 27th. In the end, the glowing season almost reached August. This has been the strangest of glowing seasons. Such predictions are difficult and largely guesswork at best, but there are other factors that we take into consideration. The ability of Glow Worm larvae to find food (over at least two years) is one, especially during periods of prolonged dryness. In the past, Sherwood Forest has undergone periods of very dry conditions which leads to dehydration of Glow Worm larvae. During some larval surveying in the late Summer and early Autumn of 2013, we found that some larvae were becoming paper thin and when rain did eventually arrive on September 6th, we found larvae taking on much needed water. We experienced yet another very mild Winter, which eventually developed into another cool and dry Spring, which was an almost carbon copy of last year. Although there were few nights with a ground or air frost, the cool nights and lack of any real warmth during daylight hours, meant that the prospect for any early females actually began to seem unlikely. A lack of rain probably didn't help matters either and some larvae found during our surveys did appear quite thin. A look at the average monthly minimum and maximum Winter temperatures for the period 2008-2017, showed that the two years producing an early Glow Worm season, both came when the average minimum temperature was over 3.5°C and the average maximum temperature was over 10.5°C for the period January to April for both years. When the average temperatures for this April were released, the average minimum temperature for this area from January to April 2017 was 3.5°C and the average maximum over 10.0°C. On May 17th, we published our predictions that this season could be another early one, and we're pleased to have been proved right for once. A .. .. .. .. .. .. .. .. .. .. .. .. .. .. .. .. .. 1 .. .. .. .. ..
B .. .. .. .. .. 1 .. .. .. .. 3 1 .. 1 2 .. .. .. .. .. .. .. ..
C .. .. .. .. .. .. 1 .. .. .. 2 2 .. 1 .. .. .. .. .. 1 .. .. ..
D .. .. .. .. .. .. .. 1 .. 1 2 .. .. .. .. .. .. .. .. .. 1 .. ..
Our continuous coverage of the Clipstone Old Quarter colony continued throughout the Spring and Summer months, but surveying a slightly smaller area than last year. This meant much smaller counts than on previous years, but still allowed us to collect comparison data for later in the year. Sections O, L, M, K, J and D formed our 2017 survey route. See map below. March 9th 0 0 0 No larvae recorded this evening. Temperature 9°C at T2. Site visited from 16:00h-17:15h. March 13th 0 0 0 No larvae recorded this evening. Temperature 11°C at T2. Site visited from 17:30h-18:30h. March 14th 2 0 0 The first larvae were found this evening, although only one of which (17mm) was alive. A temperature of 11°C was recorded from T2. Site visited from 17:45h-18:35h. March 15th 1 0 0 One 19mm larvae recorded this evening. Temperature 15°C at T2. Site visited from 17:30h-18:40h. March 16th 2 0 0 Two 18mm larvae recorded this evening, one of which appeared to have some damage to the head area. Temperature 11°C at T2. Site visited from 17:50h-18:30h. March 18th 3 0 0 Three larvae recorded this evening. Sizes were 17mm x2 and one at 15mm. Temperature 14°C at T2. Site visited from 15:50h-16:40h. March 19th 6 0 0 Six larvae recorded this evening, with sizes including 16mm, 17mm, 19mm, 20mm, 23mm and 26mm. Temperature of 13°C at T2 and site visited from 17:15h-18:05h. March 21st 0 0 0 No larvae recorded this evening. Temperature 7°C at T2. Site visited from 17:45h-18:30h. March 26th 2 0 0 Two larvae recorded this evening, measuring 17mm and 25mm. Temperature of 10°C at T2 and site visited from 18:45h-19:25h. March 28th 1 0 0 One dead 20mm larvae recorded this evening. Temperature 13°C at T2. Site visited from 18:25h-19:20h. March 30th 4 0 0 Four larvae recorded this evening, measuring 13mm, 14mm, 17mm and 18mm. Temperature 16°C at T2. Site visited from 18:20h-19:15h. April 1st 8 0 0 Eight larvae recorded this evening, measuring 14mm, 16mm, 17mm x2, 18mm, 19mm, 20mm and 25mm. Temperature 10°C at T2. Site visited from 18:55h-19:50h. April 2nd 1 0 0 One 21mm larvae recorded this evening. Temperature 12°C at T2. Site visited from 18:50h-19:50h. April 5th 3 0 0 Three larvae recorded this evening. Sizes were 15mm and 18mm x2. Temperature 11°C at T2. Site visited from 18:30h-19:25h. April 8th 5 0 0 Five larvae recorded this evening, with sizes including 15mm, 17mm, 18mm, 19mm and 23mm. Temperature 18°C at T2. Site visited from 18:30h-19:30h. April 19th 2 0 0 Two larvae (measuring 24mm and 25mm) recorded this evening, although one larva was found dead on the path. The T2 temperature was recorded at 12°C. Site visited from 18:50h-19:45h. May 8th 1 0 0 One 20mm larvae recorded this evening in section C of the survey area. There was a temperature of 7°C at T2 and the site was visited from 19:00h-20:10h. May 11th 0 0 0 No larvae or adults recorded during a search late evening. Temperature 11°C at T2. Site visited from 21:45h-22:45h. May 12th 0 0 0 No larvae or adults recorded during a search late evening. A temperature of 12°C was recorded at T2 and the site visited from 21:40h-22:45h. May 13th 0 0 0 No larvae or adults recorded during a search late evening. Temperature of 8°C at T2. Site visited from 21:50h-22:40h. May 14th 0 0 0 No larvae or adults recorded during a search late evening. Temperature of 9°C at T2. Site visited from 22:00h-22:00h. May 15th 1 0 0 One 20mm larvae recorded in section L this evening, which produced a long duration glow lasting nearly a minute. Temperature of 15°C at T2. Site visited from 22:20h-23:45h. May 16th 0 0 0 No larvae or adults recorded again late evening. There was a temperature of 10°C at T2 and the site was visited from 21:55h-22:55h. May 17th 0 0 0 No larvae or adults recorded during a search late evening. Temperature of 9°C at T2. Site visited from 21:45h-22:45h. May 18th 0 0 0 No larvae or adults recorded during a quite wet, late evening survey. There was a temperature of 10°C recorded at T2 and the site was visited from 22:00h-22:50h. May 19th 0 0 0 Still no sign of any larvae or adult Glow Worms this evening. The temperature at T2 was recorded at 9°C and the site was visited from 21:45h-22:50h. 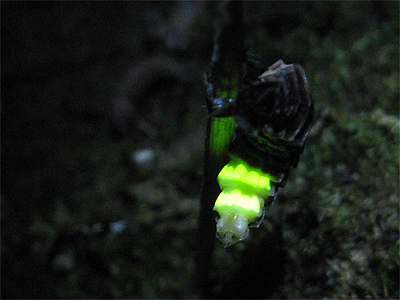 May 20th 0 0 1 The first female Glow Worm of the season (F001) was found in section K of the survey area this evening. This is the third earliest date which we have ever recorded here. There was a temperature of 10°C at T2. Site visited from 22:15h-23:10h. May 21st 1 0 0 No sign of last night's first female, on what was a cool evening under clear skies, but a pupating larva was found glowing, when disturbed by a small Lithobius Centipede. A temperature of 8°C was noted at T2 and the site was visited from 22:15h-23:15h. May 22nd 0 0 1 Female 001 was back glowing again, on a much warmer evening. There was no sign of the pupating larva found the previous evening. A temperature of 15°C was recorded at T2. Site visited from 22:10h-23:10h. May 23rd 0 0 3 Three females found this evening, present in sections K, L and O. The temperature at T2 was 15°C again and the site visited from 22:00h-23:00h. May 24th 0 1 6 Six females present this evening, including four new females and a male found with F001. A glowing female pupa was found near F004 and appeared to have been freshly predated, possibly due to a parasitic wasp found in attendance. A temperature of 15°C was recorded at T2. Site visited from 22:10h-23:20h. May 25th 0 0 2 Two new females found this evening, both in section J, but there was no sign of any of the previous night's females. 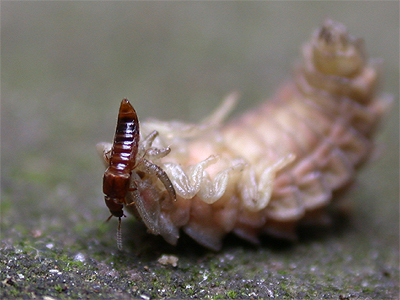 A female pupa was found in section M of the survey site, with the small Staphylinid Alaobia scapularis, which is known to predate Glow Worm larvae and pupae. A temperature of 17°C was recorded at T2. Site visited from 22:15h-23:20h. May 26th 0 1 3 Three females found this evening, present in sections O and M. F004 was found with a Male. A temperature at T2 was 16°C. Site visited from 22:15h-23:15h. May 27th 0 0 8 Eight females found this evening. Three were in section M, one in K and three in section J. Anther female was found in section O, near the end of the survey. A temperature at T2 was 16°C. Site visited from 22:10h-23:15h. May 28th 0 2 6 Six females present this evening. Three were in section M, two in section L and one in section J. Males were noted with two females. A temperature at T2 was 17°C. Site visited from 22:00h-23:10h. May 29th 0 0 6 Six females found this evening, present in section M, L, and J. The temperature at T2 was 13°C. Site visited from 22:05h-23:05h. May 30th 0 4 10 Ten females present this evening, present in sections O, L, M, K, J and D. The temperature at T2 was recorded at 14°C and the site was visited from 22:10h-23:20h. May 31st 0 4 7 Seven females found in sections M, K, and J this evening. 30 males were attracted to artificial lures used for short periods, but four males were found with females. A temperature at T2 was recorded at 16°C and the site was visited from 22:05h-23:15h. June 1st 0 5 12 12 females found in sections O, L, M, K and J this evening with five males present with females. A temperature at T2 was recorded at 16°C and the site was visited from 22:20h-23:30h. June 2nd 0 5 9 Nine females found in sections O, L, J and D, with males present with five females. The temperature at T2 was 15°C and the site was visited from 22:05h-23:05h. June 3rd 0 0 6 Six females found this evening in sections M, K and J. The temperature at T2 was measured at 11°C, which may have been the reason no males were recorded. The site was visited from 22:10h-23:10h. June 4th 0 0 8 Eight females found in sections M, K, O and J of the survey area, despite the low temperature across lower lying sections of the site. The temperature at T2 was measured at 10°C. The site was visited from 22:15h-23:25h. June 5th 0 1 34 The (almost) traditional early peak arrived this evening, with 34 females found in all sections of the survey area. The temperature at T2 was measured at 10°C and the site was visited from 22:05h-23:10h. June 6th 0 0 8 Eight females found in just sections D and J. The temperature at T2 was measured at 10°C and the site was visited from 22:15h-23:15h. June 7th 0 5 48 48 females found in sections O, L, M, D and J of the survey area. The temperature at T2 was measured at 12°C and the site was visited from 22:15h-23:35h. June 8th 0 0 15 15 females found this evening in all sections of the survey area. The temperature at T2 was measured at 13°C and the site was visited from 22:25h-23:45h. June 9th 0 0 13 13 females found this evening in sections O, L, M, D, and J, with a temperature at T2 of 12°C. The site was visited from 22:20h-23:40h. June 10th 0 4 10 Ten females found in sections O, M, K, J and D of the survey area, with the temperature at T2 being measured at 16°C. Site visited from 22:15h-23:45h. June 11th 0 0 14 14 females found this evening in sections O, M, J, L and D, with the temperature at T2 measured at 13°C and the site visited from 22:20h-23:35h. June 12th 0 8 13 13 females found in sections K, J and D of the survey area. The recorded temperature at T2 was a mild 14°C and the site was visited from 22:15h-23:20h. June 13th 0 1 12 12 females found in sections O, L, K, M and D of the survey area. The temperature at T2 was measured at 12°C and the site was visited from 22:35h-23:45h. June 14th 0 2 9 Nine females found in sections O and J of the survey area. On a warm evening, there was a recorded temperature of 18°C measured at T2 and the site visited from 22:30h-23:30h. June 15th 0 3 8 Just eight females found in sections O, J, and D of the survey area. A temperature of 15°C was measured at T2 and the site visited from 22:35h-23:40h. June 16th 0 2 9 Nine females found in sections O, K, and D of the survey area. A temperature of 18°C was measured at T2 and the site visited from 22:30h-23:40h. June 17th 0 0 2 Only two females found this evening in sections M and J. Very warm temperature of 19°C was measured at T2 and the site visited from 22:30h-23:30h. June 18th 0 2 4 Four females found this evening in sections O, J and D. A very warm temperature of 22°C was measured at T2 and the site was visited from 22:30h-23:30h. June 19th 0 6 6 Six females found this evening in sections O, M, J and D. A warm temperature of 21°C was measured at T2 and the site was visited from 22:25h-23:30h. June 20th 0 2 8 Eight females found this evening in sections L, M, J and D. A temperature of 16°C was measured at T2 and the site was visited from 22:20h-23:20h. June 21st 0 2 7 Seven females found this evening in sections J and D. A very warm temperature of 22°C was measured at T2 and the site was visited from 22:30h-23:25h. June 22nd 0 0 4 Four females found this evening in section J. A temperature of 14°C was measured at T2 and the site was visited from 22:50h-23:50h. June 23rd 0 4 9 Nine females found this evening in sections J, L, and D. A temperature of 16°C was measured at T2 and the site was visited from 22:20h-23:25h. June 24th 0 0 3 Three females found this evening in sections L and D. A temperature of 16°C was measured at T2 and the site was visited from 22:20h-23:15h. June 25th 0 2 6 Six females found this evening in sections J and D. A temperature of 13°C was measured at T2 and the site was visited from 22:30h-23:40h. June 26th 0 2 7 Seven females found this evening in sections J and D, two of which had attracted males. A temperature of 14°C was measured at T2 and the site was visited from 22:15h-23:25h. We also surveyed our former survey areas A, B, F, I and N this evening, finding just a single glowing female at the top of section N.
June 27th 0 1 4 Four females found this evening in section D. A temperature of 13°C was measured at T2 and the site was visited from 22:15h-23:10h. June 28th 0 0 0 No females found this evening. A temperature of 10°C was measured at T2 and the site was visited from 22:30h-23:10h. June 29th 0 0 1 Only female 247 found this evening in section D, was found this evening. A temperature of 13°C was measured at T2 and the site was visited from 22:30h-23:10h. June 30th 0 0 10 Ten females found this evening. A temperature of 14°C was measured at T2 and the site was visited from 22:20h-23:25h. July 1st 0 0 4 Four females found this evening in sections J and D. A temperature of 15°C was measured at T2 and the site was visited from 22:30h-23:30h. July 2nd 0 0 4 Just four females found again this evening, including one new female. A temperature of 16°C was measured at T2 and the site was visited from 22:30h-23:30h. July 3rd 0 1 4 Just four females found this evening, including one new female. A temperature of 14°C was measured at T2 and the site was visited from 22:40h-23:40h. July 4th 0 0 3 Three females found this evening in sections J and D. A temperature of 16°C was measured at T2 and the site was visited from 22:30h-23:30h. July 5th 0 0 3 Three females found this evening in section and D. A temperature of 15°C was measured at T2 and the site was visited from 22:35h-23:30h. July 6th 0 1 3 Three females found this evening in sections J and D. A temperature of 19°C was measured at T2 and the site was visited from 22:15h-23:10h. July 7th 1 0 4 Four females found this evening, including one new female in section J. A temperature of 15°C was measured at T2 and the site was visited from 22:30h-23:25h. July 8th 0 0 1 Only one female found this evening in section J. A temperature of 12°C was measured at T2 and the site was visited from 22:40h-23:30h. July 9th 0 0 0 No females found this evening during occasional bouts of torrential rain. A temperature of 15°C was measured at T2 and the site was visited from 22:20h-23:10h. July 10th 0 0 0 No females were found this evening, although two females were located in other areas of the site outside the 2017 survey limits. A temperature of 14°C was measured at T2 and the site was visited from 22:15h-23:05h. July 11th 0 0 0 No females recorded from within the survey area again, but the two females outside the 2017 survey limits were still present. A temperature of 12°C was measured at T2 and the site was visited from 22:15h-23:10h. July 12th 0 0 0 No females recorded from within the survey area. A temperature of 10°C was measured at T2 and the site was visited from 22:15h-23:05h. July 13th 0 0 0 No females recorded this evening. A temperature of 13°C was measured at T2 and the site was visited from 22:20h-23:10h. July 14th 0 0 2 Two new females found this evening in section D, these coming after a gap of five nights without any Glow Worms at all. A temperature of 15°C was measured at T2 and the site visited from 22:25h-23:15h. July 15th 0 0 2 Two females found again in section D of the survey area, one of which was a new female. A temperature of 19°C was measured at T2 and the site visited from 22:25h-23:25h. July 16th 0 0 0 No females recorded this evening. A temperature of 13°C was measured at T2 and the site was visited from 22:15h-23:10h. July 17th 0 0 0 No females found agian on a warm evening. A temperature of 16°C was recorded at T2 and the site was visited from 22:20h-23:10h. July 18th 0 0 1 Female 272 glowing again in section D this evening . A temperature of 16°C was measured at T2 and the site was visited from 22:10h-22:05h. July 19th 0 0 1 Just female 272 glowing in section D this evening . A very warm temperature of 19°C was measured at T2 and the site was visited from 22:00h-22:35h. July 20th 0 0 0 No females recorded this evening . A temperature of 12°C was measured at T2 and the site was visited from 22:05h-22:35h. July 21st 0 0 1 Just female 272 recorded this evening in section D. A very warm temperature of 17°C was measured at T2 and the site was visited from 22:00h-22:40h. July 22nd 0 0 1 Female 272 recorded this evening in section D. A temperature of 15°C was measured at T2 and the site was visited from 22:00h-22:35h. July 23rd 0 0 0 No females recorded this evening. A temperature of 14°C was measured at T2 and the site was visited from 22:05h-22:40h. July 24th 0 0 1 Female 272 recorded this evening in section D. A temperature of 15°C was measured at T2 and the site was visited from 22:05h-22:40h. July 25th 0 0 1 Female 272 glowing in section D. A The temperature at T2 was 13°C and the site was visited from 22:00h-22:35h. July 26th 0 0 1 Female 272 glowing this evening in section D. A temperature of 14°C was measured at T2 and the site was visited from 22:10h-22:40h. July 27th 0 0 1 Female 272 still glowing in section D. A temperature of 14°C was measured at T2 and the site was visited from 22:00h-22:40h. July 28th 0 0 0 Female 272 not found this evening. A temperature of 15°C was measured at T2 and the site was visited from 22:00h-22:35h. July 29th 0 0 0 No sign of female 272 this evening. A temperature of 16°C was measured at T2 and the site was visited from 22:10h-22:45h. July 30th 0 0 0 No sign again of female 272 during this evening's survey. The temperature at T2 was 15°C and the site was visited from 22:00h-22:40h. July 31st 0 0 0 No females recorded on our final survey for adults this year. The temperature at T2 was 16°C and the site was visited from 22:10h-22:45h. 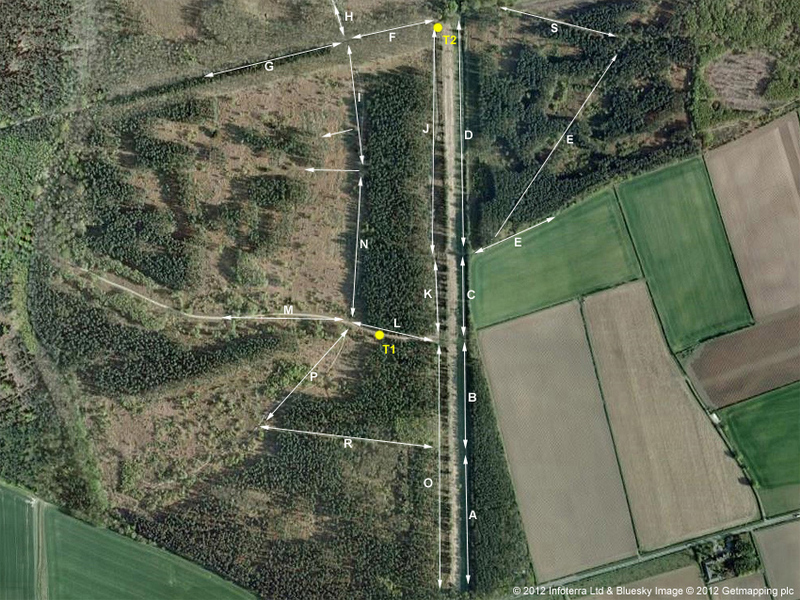 Below:- Arial map showing the survey area and former route we used to take each night. For female Glow Worms, sections O, K, J, D and possibly L, M and C, will form our 2017 survey route. Larval surveys are made in sections A, B, C and D. The two yellow dots show the two locations (highest and lowest points on site) where the temperature is taken during the season.